Volunteers and supporters alike needed! 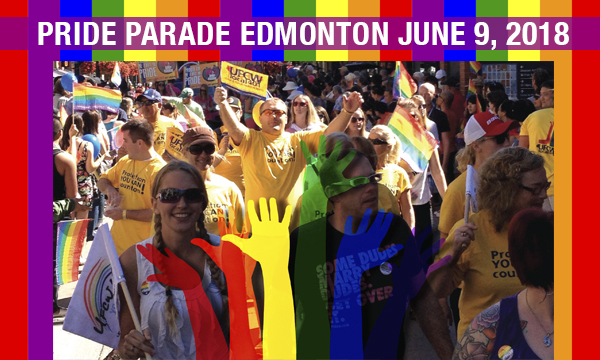 Every year UFCW 401 members contribute to the overwhelming success of the Edmonton Pride Parade! Don’t miss out – be a part of this mind-expanding celebration! It is more fun, music, laughter, and colour than is probably legal in most provinces! Needed volunteers and supporters alike! Contact your Steward or Union Representative and watch our Facebook Page or here for more details. We will begin staging at 9:30 a.m. and will be located along 79 ave. somewhere between 107-109 street. Our float will be easily recognizable with all our brilliant yellow colouring and we have been assigned entry #21. Be sure to meet us before the parade starts so you can hang out with some absolutely fabulous folks and loud’n’funky tunes sure to get the crowd groovin’! Wear your pride! Don’t forget your t-shirt if you received one in the past.